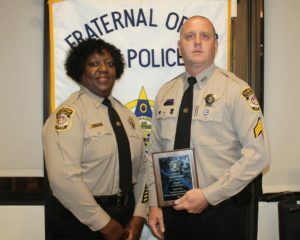 The Hampton Fraternal Order Police, Lodge #26 recently celebrated and awarded the outstanding law enforcement officers from our local areas who have distinguished themselves with their service to their agency and the community in the past year. Sergeant A. Peek is the Deputy of the Year for the Hampton Sheriff’s Office. Peek is a twenty year veteran of the Hampton Sheriff’s Office and is currently assigned to Court Services, as the Deputy of Training and Development overseeing and coordinating all training and supervises the Training Coordinator. Sergeant Peek is also the SERT Team Commander, a Field Training Officer and a Project Lifesaver Search and Rescue technician. Pictured from left: Colonel K. Bowden, Undersheriff and Sergeant Peek.